I was so excited to see a riders forum on my new bike! I had to wait just to sit on one and then wait again to get the bike in since they were selling before they got to the shop's around the bay area California, but so far I love the bike! I have read the forum's about heat of the engine and noticed the same things. Dealership said if it goes over 250 F then pay attention to warning lights and stop the bike. I road in weird 100 degree weather for May here and it never got over 225. The concern i have is the frame that sits under and both sides of the tank is extremely HOT, but only on the left side and i can feel heat coming up from underneath me and between my inner legs. I called the dealership they said its fine, but when I took it in for 600 mile service the tech felt it and said it was weird they followed up with BMW and they had them check the temp after 45 minutes of riding. It temp'd out at 154F which bare skin was touching it could burn a person's skin. Now keep in mind this is just the left side and where my leg goes. I would expect hotter temps on the engine but not wear my leg is. 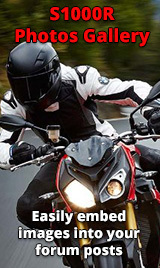 BMW told the dealership these engines run HOT, and that its within constraints and rider should wear proper gear. Has anyone else notice this on their bikes? any help or thoughts? I get the bike is hot but this just seems weird to have it that hot only on the left side of the frame and feeling heat coming up from underneath me. I would never ride the bike with shorts but if i was to it would definitely burn my leg. Could it be coming from the catalytic coverter? I think I read somewhere that a full decat exhaust would help removing some heat from the bike. I've noticed that the bike gets very hot compared to other bikes I've ridden, but I think most litre naked bikes feel hot more or less like the s1kr does. At least the high power ones of newer age.. The ducati s4rs also gets very hot. Thanks for the info. Just wondering if anyone else is experiencing the frame getting so hot on the left side. Is that normal? Yeah, I noticed it on yesterdays ride, only my 3rd time on it. Lots of hot air hitting my left leg but none on the right. I wear goretex & I could feel it, I'll be glad of it when it gets colder. I'd say it's nothing to be concerned about, the heat will exit where it's able to. This bike is a stunning ride I can forgive it almost anything. Funny, I have much more heat on my right side. I noticed mine doing the exact same thing today - left frame where the leg touches. All the IL4 I have ridden get a bit toasty and the S1R is no different, even the triple brutale from MV Agusta got as hot as the BMW so nothing to worry about. I noticed the heat yesterday for the first time but it was only in traffic when the fan comes on. I think the fan is mounted on the left hand side of the radiator so blasts the hot air down that side. I don't have a problem under normal riding when the fan isn't running. Mine doesn't seem to feel any hotter then my old Triumph Daytona. The s1kr hasn't had to sit in summer traffic yet though, but atleast it doesn't have under tail exhaust, that thing cooked my thighs. It'll heat up quickly if you're stuck not moving or in slow traffic. I've had bikes that run hotter, but the left frame where my leg touches is pretty darn warm. It's not a problem for me, though.